At Construxnunchux, we are constantly driven to go further, more bizarre, more extreme, more abstract, and any other adjective you have for weird. 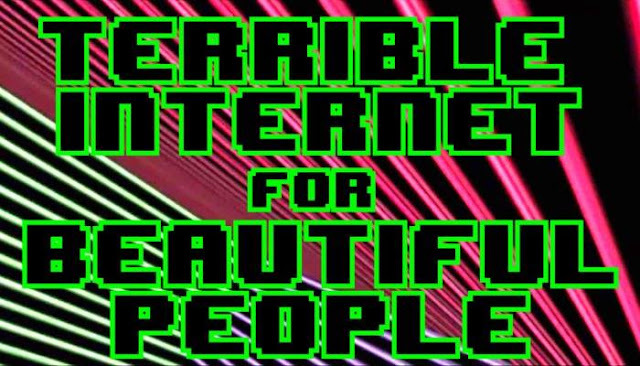 I think we do a good job contributing to the strange internet collective with our Lobster Lobby series, the short-lived The Internet is Hard, and our signature touch on really any project. There is a place on the internet dubbed "the weird part of [ ]" which is usually resigned for the truly strange, the disturbing, and the unexplained. I am going to brave these toxic waters of the horrid parts of the world wide web (and maybe even deeper) to call to attention to some of the most insane things I have seen with my own two head balls. Let me promise you that this WILL NOT be traditional strange but it will be something transcendent of your imagination. The Legend: Shaye Saint John was an ex-super model who was hit by a train and/or car (both stories were told) and the injuries to her body caused facial disfiguration, arm and leg amputation. She replaced her lost limbs with mannequin parts to shuffle through her adventures. Shaye lives alone in her trailer, surfing the internet (24/7! ), applying Skin Tape (for her condit-shon), and celebrating holidays for the pieces of trash in her neighborhood. What is really is: She is the creation of the late-comedian Eric Fournier. who was simply a creative genius. Purposefully anonymous, Eric only "filmed" Shaye keeping the aura of mystery surrounding his character. Why I love it: I admit my sense of humor has always been non-traditional. I love Shaye Saint John. I love the concept, I love the execution, I love the lo-fi, I love the insanity behind it, and I love that there is nothing else that I've seen like it. The Shaye videos are funny and unsettling at the same time. Upon first look it seems like unbridled madness but once you dig into any of the video's you can see how much hardwork, innovation, and creativity goes into creating his phenomenon. Shaye Saint John was the cliche "before his/her time". This was before the YouTube movement, before viral videos, before creepy pasta, this was a true and pure expression of someone's genius. WHY THE PENGUINS MUST PLAY ZATKOFF IN GAME 6!! !